I have wanted to be a comic artist since elementary school when I picked up an issue of Secret Wars at a garage sale. I came into professional wrestling and decided to run with that while youth allowed me, and had a fantastic 13+ year career . 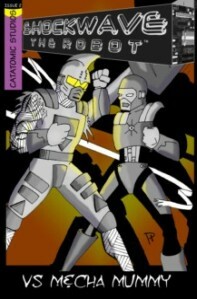 Now my main focus is getting my comic book career off the ground and to the moon! I like to dabble in just about everything I can to broaden my horizons and strengthen myself as an artist and foreward thinker. I am always looking for creative challenges in physical and psychological conditions, I also really like icecream. Sketching all my life, I decided the only way to push myself to a professional level was to work at a professional level. 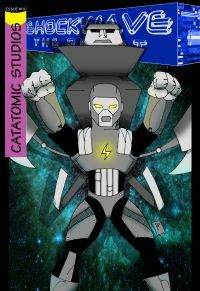 I started self publishing as CATATOMIC STUDIOS. This would force me to draw situations I was not used to, and thus hone my ability to work at a better quality and produce work for deadlines. My first book was grey toned with color pencil and had a hand painted cover with story book style lettering. It was a train wreck but it set the wheels in motion. 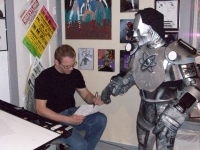 Though Penciling is my goal I currently do all my own penciling, inking, coloring, lettering and admin work. These other duties take time away from pencil practice but its the only way to affordable finish the books, and the finished book is the best way to look at where I can grow and improve my drawing! Is based on a fellow pro wrestler and has sold at wrestling shows around the world. Is stand alone short stories inspired by the Twilight Zone and similar shows. This is a great way to draw everything from an office to ninjas, to skaters, super heros or pirates!